Vienna Rehabilitation Center's expansive tech gym and private therapy rooms offer the San Joaquin region a modern approach to rehabilitation therapy. Physical, occupational and speech therapy programs are conveniently offered near Lodi Memorial Hospital’s medical center offices. Skilled licensed therapists guide patients through a range of rehabilitation programs like those necessary after hip and knee replacement and stroke. Vienna's expansive tech gym features the latest in equipment and technology, including a computerized virtual rehab program similar to an XBox application on a large screen. Flat-screen televisions for therapy and entertainment are visible from every vantage point. Three private treatment rooms allow therapists to focus on individual rehabilitation needs. A kitchen, laundry room and bedroom are all set up for occupational therapy. 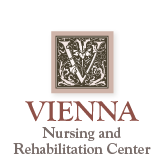 Vienna nursing home residents have easy access to audiolology and dental check-ups in private exam rooms on site. Outdoors, a unique, garden-like “texture path” helps rehabilitation patients increase their mobility on a variety of surfaces including grass, river rock, stepping stones and a small bridge. Accented by relaxing water fountains, plants and benches, this tree-lined path is adjacent to the rehabilitation center.